Should Christians Bother to Vote When Both Sides Are Controlled by the Enemy? | Have Ye Not Read? An argument erupted on Facebook over the last few days about whether or not Christians should even bother to vote, knowing that both political parties are controlled by the Kenites and indeed, that the entire political system is controlled by the Kenites. My argument, in response, is that both sides of the system have always been controlled by the Kenites, and that there have only rarely been times in world history — since Cain left the Garden of Eden and began constructing cities — when this wasn’t so (for documentation, see my previous Bible study, Builder of Cities). 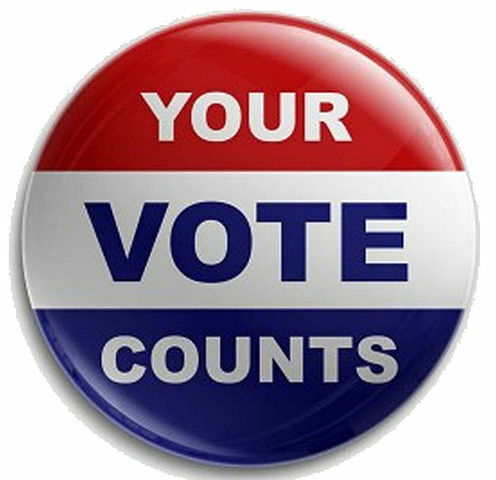 Yet in spite of almost universal Kenite control, we as God’s faithful servants still have an obligation to vote and to participate in the system. Why? For the explicit purpose of helping mitigate the damage the system would otherwise do to God’s Christian people if we failed to participate. And also, perhaps even more importantly, to help make sure God’s Word can continue to go forth unhindered to the greatest degree possible. First, I have to admit that in my old age, I do indeed have a very hard time even remotely participating in this system any longer, considering the fact that both sides — Republican and Democrat alike, and everything in between — are controlled by the enemies of Christ, the Kenites. In reality, I just want to be left alone. I’d mind my own business and go on about my life, if the system would let me. But those who control the system won’t let me. They keep passing more and more laws that directly impact my Christian life – and yours, as well — in a decidedly negative manner, whether we’re participating in the system or not. So I do vote and I do participate in the system (albeit, to the most limited degree possible), for the express purpose of trying to at least curb some of the damage these ungodly workers of wickedness are doing. At 62 years old, I think about pulling out of the system now, more so than I ever have in my entire adult life. But then I think about Daniel, Shadrach, Meshach and Abednego, each of whom worked in high positions within the Babylonian government — the very Biblical type of Satan’s world system. And when I think about that, all of my arguments against participating in today’s Kenite-controlled system go out the window. Daniel, for example, took advantage of his post within the Babylonian system — he was actually a tax collector for the system, when you examine the Scriptures closely — to try to influence Nebuchadnezzar to treat the children of Judah better. And if you know your Bible well enough, you also know Daniel and his companions often stood firm in their faith within the system, and at dire threat to their own lives. So I participate in today’s Kenite system for much the same purpose, which is to say, I vote for the people who claim they’re willing to do the least damage to individual rights, and who are most likely (to the best I can tell beforehand) to stand up for people’s rights as the people’s representatives. That way, the Word of God can continue to go forth as unhindered as possible, and more people can receive it. If Christians were to pull out of the system now, before Satan even gets here, how could God’s Word go forth? It would be outlawed virtually immediately because there would be no Christian opposition. Do I have high hopes the politicians I end up voting for will accomplish their lofty promises? Nope. I gave up on high hopes after Reagan. That’s what makes the current situation so gut-wrenching. But I honestly do think God expects us to continue to contend for the faith (Jude 1:3), particularly when the faith is under attack by the powers-that-be. And we can’t follow that Biblical admonition to contend for the faith if we’re not participating in the system at least to some extent. That’s why I’ll vote for the candidate most likely to protect my rights to teach God’s Word, as well as to protect my individual rights under the U.S. Constitution. Of course, we all know Satan is well beyond our influence. So when he gets here all bets are off and I’ll be looking forward (and am preparing now) to pull completely out of the system. Because Biblically speaking, I cannot justify participating with him or his system at all, in any manner. I will not take the “mark of the beast” (which, as you know, involves working hand-and-mind in his system and on his behalf). Satan in his role as the false Messiah will demand we pledge our fealty to him, hand and mind, in order to enjoy the benefits of his system. And I cannot and will not do so. That’s because I have pledged my fealty to the Lord Jesus Christ, who is the One who sent us to this earth in the first place, to help in his great plan to save His children. So between now and the time Satan arrives to this earth, I’m going to put up what fight I can on behalf of His Word. And I’m going to vote for the candidates most likely to uphold my rights to do so. And that requires being part of the system (at least to a limited extent) and utilizing that system to the best of my ability – yes, in spite of the fact that the system has become so decidedly wicked that it almost hurts to be a part of it. Nevertheless, we can’t at this point just pull out of the system and allow the wickedness to run rampant, crushing the bringing forth of God’s Word in the process. There has to be Christian opposition within the system. What Is “the System” Anyway? What really cracks me up is that the people arguing against Christians voting and arguing against people participating in the Kenite system, are doing so on Facebook. Listen, if you don’t think Facebook is part of the Kenite “system” then you probably need to pull your head out of the sand and take a good long look around you. I have two words for you: Mark Zuckerberg. Even just using the internet in general constitutes being part of the Kenite system. In the Hebrew language, “www” is just the Hebrew transliterational equivalent of the letters “vav vav vav” which numerically correspond to “6+6+6” which adds up to 18, which in turn is the biblical number of captivity (with the Biblical number of the beast hidden within it). Why do you think they call it the “world wide web”? So my question is this: When we say we’re no longer going to participate in the system at this point, because it’s Satanic, then how much of a purist should we be about it? Do we give up the internet, as well? If not, WHY not? Or do we do our best to use this modern means of communication – even though it’s fully a part of the Kenite system — to try to educate others to the truth of God’s Word and to help pull at least a few more of God’s children from the fire? In my view, we use the Kenite’s own tools against them. And that includes everything from the internet to television, to voting in their own political system. If you really think about it, even much of the food you buy at the grocery store is marked with a tiny “K” on the labeling (standing for Kosher, which of course, means the food is fit for a Kenite “Jew” to eat). Yet we eat that very same food, even though that designation is government-enforced on behalf of Christ’s enemies. Maybe we should pull out of eating, as well? But that would be silly, wouldn’t it? What’s more, now they’re also trying to force food manufacturers to designate foods with an “H” (for Halal), meaning it’s fit for Muslims to eat. It’s true. We are “accounted as sheep for the slaughter” by the enemies of Christ. And there’s not much we can do about it but firmly and faithfully stand our ground on His behalf within the very system the enemy has erected around us. After all, God sent us here. But He didn’t send us here to pull out and hide. So where do we draw the line in participating or not participating in the Kenite system we now live in? Yet we all watch TV from time to time. And we support Christian TV teaching ministries to help get the Word of God out to the masses. In other words, we use their own tools against them. So why not voting, as well? “Fear not, for I Am with you; do not be dismayed, for I Am your God, I will strengthen you and help you; I will uphold you with my righteous right hand” (Isaiah 41:10). So I do my part, for now, and work within the system we’ve all been placed in. I vote. And I use every other tool at my disposal, as well – knowing they’re all controlled by the Kenites. I use the tools this system provides in order to contend for the faith and keep God’s Word flowing forth. I’m not afraid to use their own tools against them, on God’s behalf. But I do indeed look forward to pulling completely out of the system when the adversary arrives, as well as to standing up against him publicly, and if I’m so fortunate, to being delivered up to those trials described in Mark 13 and Luke 21 where the Lord Himself speaks through us and handles our promised deliverance. Yes, it’s a barely palatable situation at this point in time. I’d much rather just flee to some mountain top in northern Idaho, grow my own food, hunt, fish and drink water out of a creek, and only go into town from time to time for necessities like toilet paper. I’ve never been one of those Christians who needs so-called “fellowship.” I get my fellowship with Him, directly, by reading and studying the Bible, and occasionally by communicating with other like-minded Christians. To be perfectly honest, I just don’t like most people I meet these days. But, I always have to remind myself they’re the same people God put us on this earth, behind enemy lines, and within the enemy system, to help save. Our heavenly Father wants His Word put in front of them. So I do my part. And for me, that requires participating in the system, as effectively as possible and making sure the Word of God can go forth until that time when our old adversary finally arrives. Daniel, Shadrach, Meshach and Abednego participated directly in the Babylonian government of their day. They even held high positions of power within that system. Again, they participated without hesitation in order to help mitigate as much damage to God’s people as possible by the Babylonian government and system. And that’s reason enough to vote, today, in my view. We vote to help mitigate the damage. We vote to help slow down the inevitable destruction of our rights to put God’s Word in front of as many people as possible while there’s still time. I won’t work directly in the government at this point. Been there, done that. And it was decidedly awful. But I will do what I can to help mitigate the damage caused by our Kenite-controlled government, and to help keep God’s Word flowing forth, and that requires (for me) voting, even though I know I’m always voting for the lesser of the two evils. Keep in mind that at His first advent our Lord and Savior worked behind enemy lines. He paid taxes. He obeyed the government laws of the land. And He did so in order to make sure the Word of God could go forth relatively unhindered. Nothing has changed. We too were sent by God to work behind enemy lines. And that requires participating in the enemy system, and yes, even using their own system against them in order to help save a few more of His wayward children through the bringing forth of His Word. Get out and vote. Buy some more time by voting for the candidate most likely to protect your rights. And help carry forth God’s Word all the way up to the point at which the whole damned system collapses and our old adversary finally arrives. Then we can (and must) pull out of the system, and take our stand against it and its dark ruler. That’s my point of view on the matter, and I’m sticking to it. they drew lots so that God had a hand in choosing there leaders. we don’t need God’s intervention in our lives and it shows. take your ballot and put it in a dark place. Wrong on too many counts, Red Pill. They only drew lots in the Old Testament. After the northern and southern kingdoms were destroyed, there was no longer any need for lots. So you’re comment “Nobody in the bible voted, they drew lots” is erroneous. You wrote, “We don’t need God’s intervention in our lives and it shows.” Wow. Why are you even on this site, then? You can always unsubscribe. You wrote, “Take your ballot and put it in a dark place.” How very Christian of you, Red pill. You missed the whole point, by the way. God’s faithful servants, like Daniel, participated in government, even when government was ungodly, such as in the kingdom of Babylon. They do so for the purpose of helping government be MORE godly than it is. They set the example. Is it hard? Yep. Very. But God never promised us a rose garden on this earth. However, I ascertain from your comments that you don’t even believe in the need for God’s presence and purpose in our lives (“we don’t need God’s intervention in our lives and it shows”) so again, I must ask, why are you on my list? You can always unsubscribe if you’re unhappy with what you read.